I hadn’t anticipated this. While planning my winter wardrobe for the SWAP challenge, my mind has turned to trousers. This year I may create three or four pairs of trousers and not a single skirt! Currently I rarely wear trousers for work or formal occasions, but I am thinking of changing my ways. My aim is to make tailored trousers which are both formal and elegant, but also comfortable and flattering. This is quite a tall order, and one that I have not yet resolved. I have toiled a pair of Burda tailored trousers. This is a photograph of the model in a snake-skin version. With some kind of rubber, stilt shoes and thick leather jewellery. Not sure if the photograph it tells you anything about the trousers. I am thinking of making these, with a number of alterations, in my Squiggle fabric and matching them with the 1967 Simplicity jacket. I also made a pair of shorts, using Burda 08/2014 110. Again an unrevealing model shot (in terms of the construction of her shorts). My plan at the moment is to make these as a wildcard in pink boucle, matching them with a RTW cardigan. By spending quite alot of time over the past two weeks on creating test garments, I have worked out what changes are needed to the patterns. I have run off the shorts pattern again because my changes are so extensive. I need to alter the trousers too. By having the patterns right at the start of the SWAP sewing period (26 December to 30 April 2015) I will be able to start sewing without worrying about fit, style or technique. That takes alot of stress away and means you don’t have to keep trying on and messing around. You can just sew carefully and accurately, and it is easier to keep the fabric pristine. I don’t want to be pretentious, but it is a bit like a surgeon practising on a computer model before separating co-joined twins, for example. You want to know what you are doing before you make the first cut. 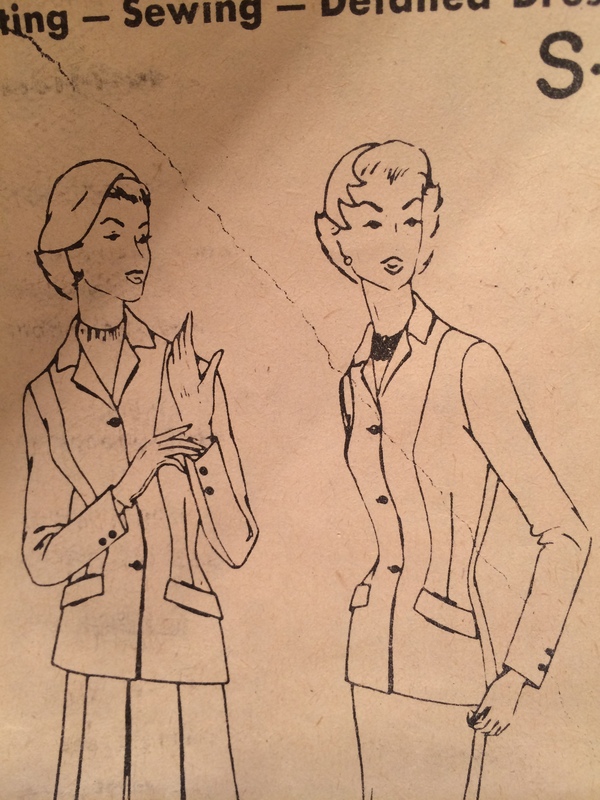 I am not sure at the moment if I will pair the 1950s grey crepe Simplicity 100 jacket with trousers or a with skirt. But if it is trousers, how about a 1980s pattern? Something high-waisted, in linen perhaps, with wider legs? I am unsure about this idea – I will need to make a toile not just to adjust the fit but to see if this style of trousers will suit me or not. And will a fuller, pleated pant work with such a highly fitted jacket? On the pattern envelopes the 1980s trousers go with loose fit collarless jackets with big shoulders, providing balance. However the greater challenge is getting a style to suit me. If it goes horribly wrong I can easily fall back on a skirt as I have lots of pattens already tried and tested. I had already planned a pair of more casual trousers, in turquoise stretch cotton. These would be matched with a hand painted silk shirt. If I plump for pants I will be making more toiles (initially I had not planned to toile more than three or four items, relying instead on TNT skirt patterns). Going for trousers will make the plan a lot more challenging for me, as I will have to do more practice sewing, fitting and experimenting. (I don’t need to toile the shell top, Burda boyfriend coat, or indeed the cardigan). There are now only three weeks left before Sewing starts. I may be able to toile one or two more items on this list but it is not practical to finish everything before Christmas. I will prioritise the S100 jacket as it is the most difficult item in terms of fit in my SWAP. However I will not worry too much if I don’t do another toile, as we have four months of sewing time – plenty of time to have a few dry runs while I get started on the plan. I need to think about the unidentified blouse, and the ready to wear cardigan too, but I am getting there. I would welcome your feedback. Yes please trousers! How exciting. I find skirts can be too bulky for me in wool, and I sometimes feel a bit ‘schoolgirl’ in them. Trousers can be easier to get down on the floor and play in! There is something that I’m not sure I’ve understood properly about the SWAP rules : Do all bottoms need to work with all tops ? In this case, the squiggle trousers may be hard to match with all your tops ? Yes the rules do mean that the tops need to go with the bottoms, and I agree the squiggle fabric is quite difficult. Of the three tops (apart from the matching jacket) we have white (beetles), grey (and silver beetles) and a purchased cardigan (pink or grey predominantly). The only worry really is the multicoloured painted silk blouse, which will include magenta and charcoal plus turquoise, white and perhaps one other colour. If it doesn’t work I may change the plan, but I believe in mixing patterns and want a challenge here. What do you think? I think you’re not choosing the easiest way, ( = plain bottoms to match printed tops, my way to think about this plan and which shows my appalling lack of imagination) and that’s why your outfits will be outstanding ! I think this is exciting, Kate, especially since trousers are an area you have explored less often than skirts. As you note, you can always fall back on skirts if the trousers aren’t to your liking. I have to admit that I am not very good at envisioning looks before I see them on a body. I have to experiment with proportions, look in the mirror, adjust, etc. The idea of pairing a more fitted jacket with pants is exciting though. The S100 jacket is long and quite fitted, so the bottom of the jacket is going to conceal pleats. I would probably pair it with slimmer pants. That said, I’m really not sure. I have always loved full trousers – either fitted at the top and with a flared leg, or pleated and full. You could always go to some boutiques and try on some items to see how you like mixing different fits (I tend to “cheat” so would possibly do that). I actually haven’t worn particularly full-leg trousers in a while, but I used to pair them with shorter jackets or just with a pretty blouse, interesting belt and soft cardigan. Thank you Stephanie.The thing that got me thinking of pleated trousers with the S100 jacket is the View 2 – ie the jacket with a pleated skirt. The line drawing shows the outfit to the hips and I was imagining those box pleats extending down as trousers. The V2299 (tech drawing at top of post) describes them as “Tapered pants have raised waistline with tucks, carriers and side pockets”. I am still interested in this and will certainly toile the trousers.